You are here: Home / Printables / Color Coordinated Packing Labels for Your Next Big Move! Color Coordinated Packing Labels for Your Next Big Move! Color Coordinated Packing Labels are a MUST-HAVE for your next big move! Fortunately I have only moved 2x in my entire life. The first time was when I got married and we moved into our first apartment together. The second time was a few months later when we purchased our first home. I remember the first move wasn’t too bad. All I was really moving was my bedroom and bridal shower gifts. My husband didn’t have much to move either. We bought furniture once we were settled into the apartment. Our second move, however, was a little more involved. During those few months in the apartment, I worked from home so we accumulated some office equipment and a bunch of other things that needed to come with us to our new home. I remember we hired a moving company and by the time they were done loading the truck I was throwing anything and everything into garbage bags asking them to throw that stuff in the truck too. I had zero system in place and was not the least bit organized. Had I known that we would only be living in our apartment for a few months I would have TOTALLY decided to rent furniture instead. Believe it or not, our apartment had a bigger living room, master bedroom and kitchen then the house we bought so trying to squeeze all of our new, big furniture in our smaller home was a challenge. You live and learn, right? The purpose of this post is to provide you with moving tips – things that you may not think to do if it’s your first move or tips for making your 15th move more efficient. #1 PURGE: This one is super important. As I mentioned earlier my mom’s advice to me was to throw things away. She was completely overwhelmed by all of the stuff they had accumulated over the years. Things that probably could have been given away or tossed years ago but for some reason had not been. Instead of just dealing with packing things up and other stresses that come with moving, she was dealing with sorting through a ton of things that could have been disposed of years ago. #2 Get boxes from local grocery stores to save money: One thing grocery stores have no shortage of is boxes. With the amount of deliveries they get in on a daily basis, they have plenty of boxes. Stop by your local grocery store and find out who you can speak to about taking some of those boxes off their hands. This is a great way for you to recycle AND save money. #3 LABEL: Whether you are downsizing to a smaller home or finally moving into that dream home you’ve always wanted you will definitely NEED to label your boxes. I created FREE PRINTABLE color coordinated labels to help make this part easier. Each label is the size of a half a sheet of paper. Every room has it’s own color label along with space to write which floor the box should be taken to and what the contents are. If it’s a bedroom, there is room on the label for the person’s name. I can’t guarantee that you won’t be searching for some things after the big move but this will definitely help you stay more organized and will make the unpacking process go more smoothly. #4 Pack the truck or pod by room: This one is fairly simple. Keep all of the boxes per room together by packing the truck or pod by room. 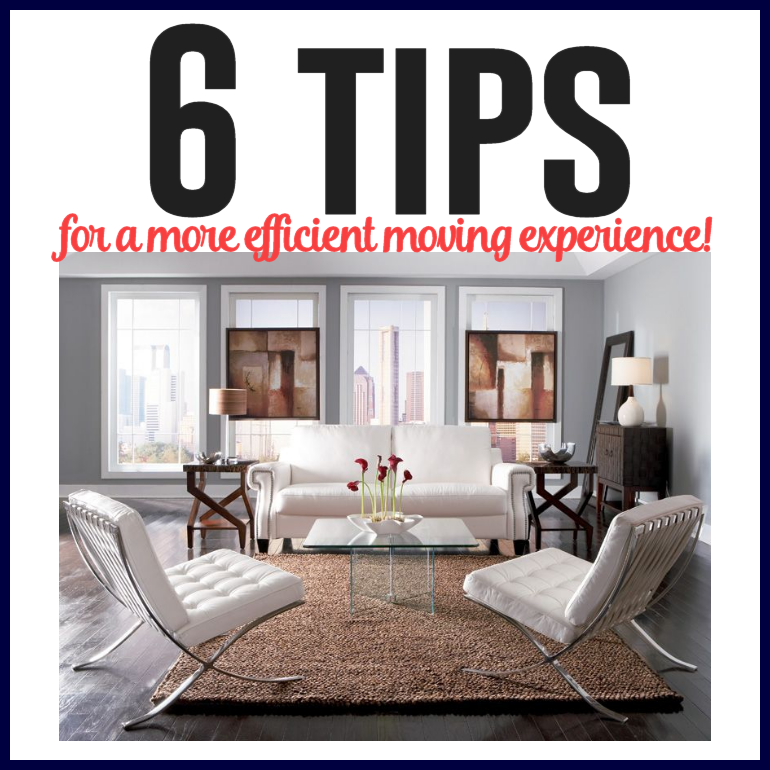 Melissa from The Happier Homemaker has some great tips about this part of the move as well. You’ll definitely want to read that post. She touches on things I would never have though of. #5 Make a necessities bag: – I got this awesome tip from Elizabeth Joan Design. Making a necessities bag is a genius idea. Think of it like packing a bag for a trip. Throw in a few changes of clothes, toiletries, electronics chargers, etc. and you won’t have to feel the added pressure of digging through the boxes and boxes of things just to find the toothpaste and a fresh pair of undies. #6 Consider Furniture Rental: As I mentioned earlier in the post, I wish I had thought to rent furniture when we first got married. It would have saved us time and money when we moved just a few short months later into our home. If you are a military family or a college student or maybe even just moving out on your own for the first time CORT Furniture Rental is a viable option. Not only do they have an amazing selection of furniture but they are affordable too. You can rent furniture by piece, by room or an entire living space. There are many packages to choose from, including military rental, office rental, student rental, .etc. CORT Furniture Rental makes it easy on you. You can even get it all set up online. I think this is such a great solution, especially for temporary living conditions. They great thing about is that you don’t have to sacrifice style.